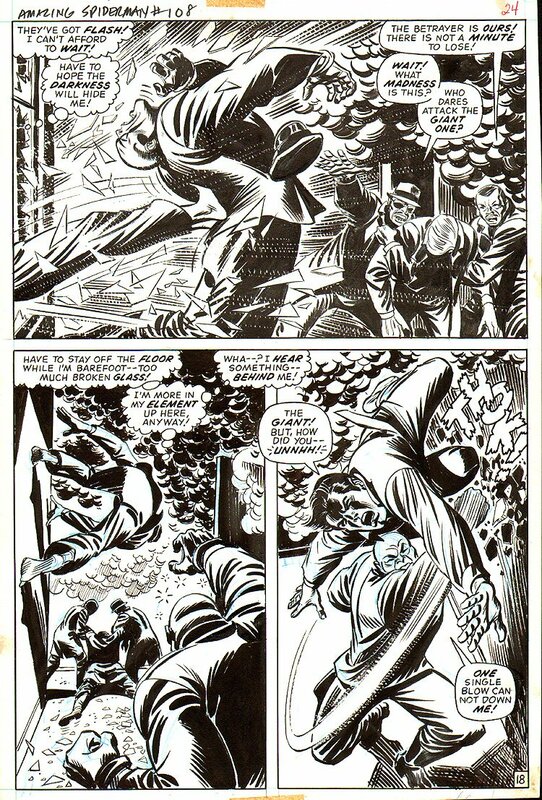 Absolutely incredible and rare penciled AND inked pages by John Romita, Sr on his signature title, are EXTREMELY RARE to find for sale on the open market! Just check out this All out action with Peter Parker who cant find away to change into Spider-Man, battles "The Giant One!" on this wonderful 3 panel page with a HALF SPLASH battle scene, as thugs try to kidnap Flash Thompson. Romita has said that this was his favorite storyline EVER in his 60+ years of drawing comics, and it shows! The detailed line work and heavy inking, with AWESOME tell-tale Romita RAZOR CUTS on the art board to show movement, are all amazing. Romita only penciled and inked 8 ASM issues during his 1970's run on ASM, so don't miss out on an opportunity to own a piece of history!